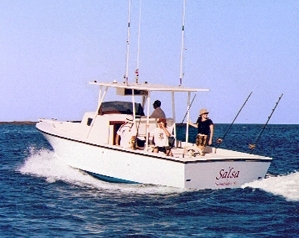 This very fast and very well-known 27ft Escapade out of Tamarindo, powered by a 220HP Cummins inboard diesel engine, has Captain Leo at the helm. She has a 10-foot beam, a walk-around cuddy cabin with V-berth and head, and lots of room and shade. The boat is outfitted with a fighting chair, outriggers, depth sounder, GPS and radio. Penn International and Shimano tackle are carried for conventional fishing. The boat can take up to four anglers.